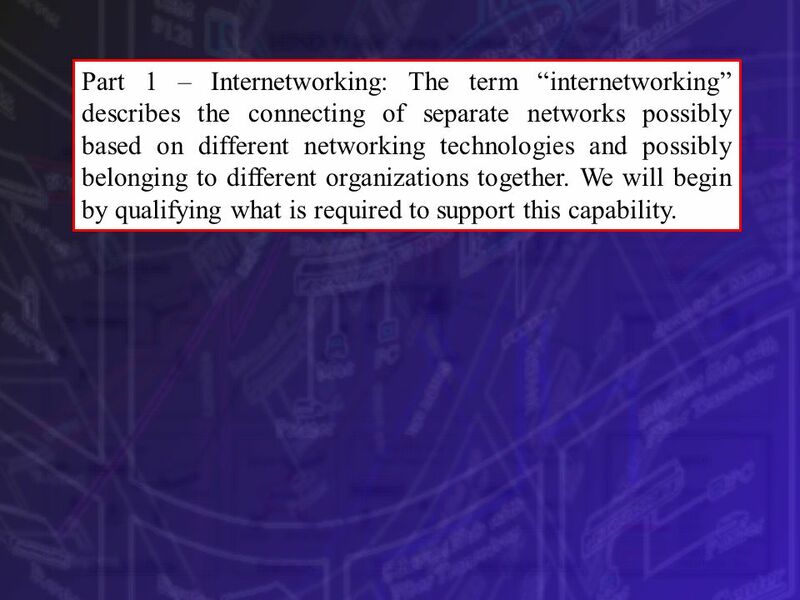 2 Part 1 – Internetworking: The term “internetworking” describes the connecting of separate networks possibly based on different networking technologies and possibly belonging to different organizations together. We will begin by qualifying what is required to support this capability. 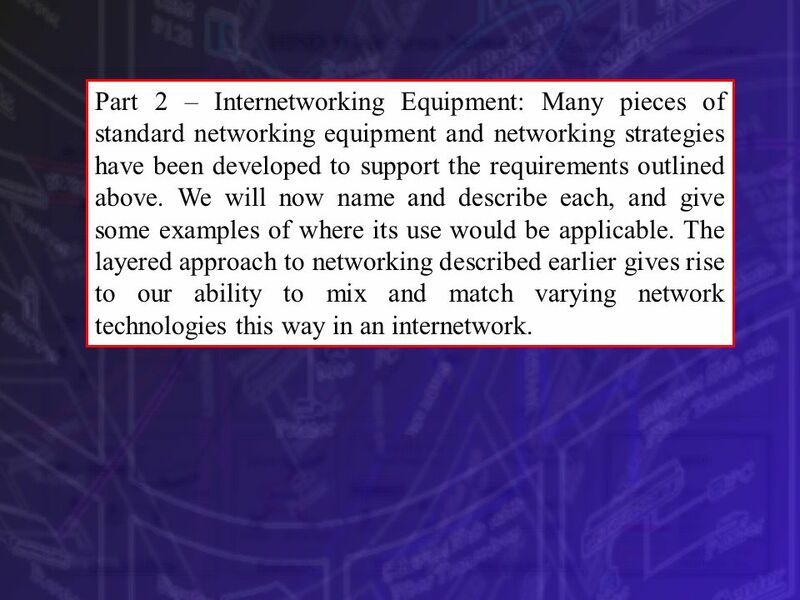 4 Part 2 – Internetworking Equipment: Many pieces of standard networking equipment and networking strategies have been developed to support the requirements outlined above. We will now name and describe each, and give some examples of where its use would be applicable. The layered approach to networking described earlier gives rise to our ability to mix and match varying network technologies this way in an internetwork. Does NOT create a logical extension - i.e. 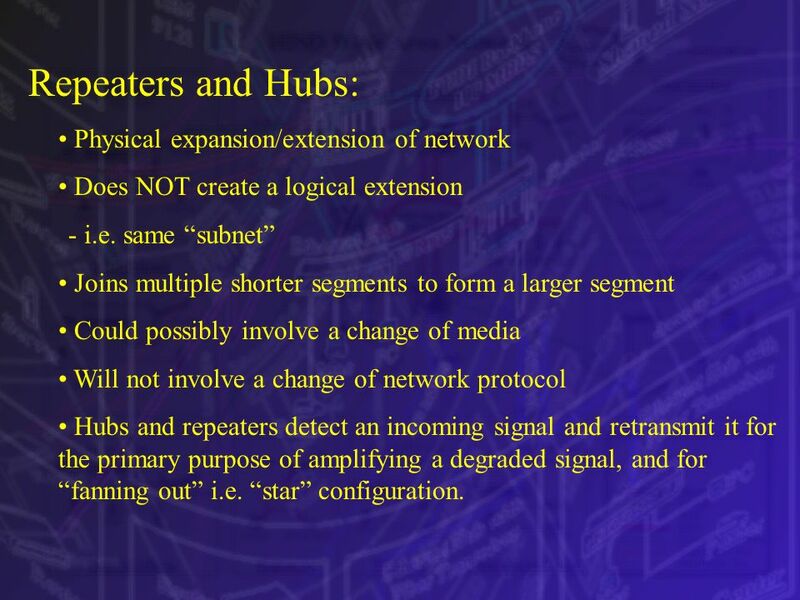 same “subnet” Joins multiple shorter segments to form a larger segment Could possibly involve a change of media Will not involve a change of network protocol Hubs and repeaters detect an incoming signal and retransmit it for the primary purpose of amplifying a degraded signal, and for “fanning out” i.e. “star” configuration. 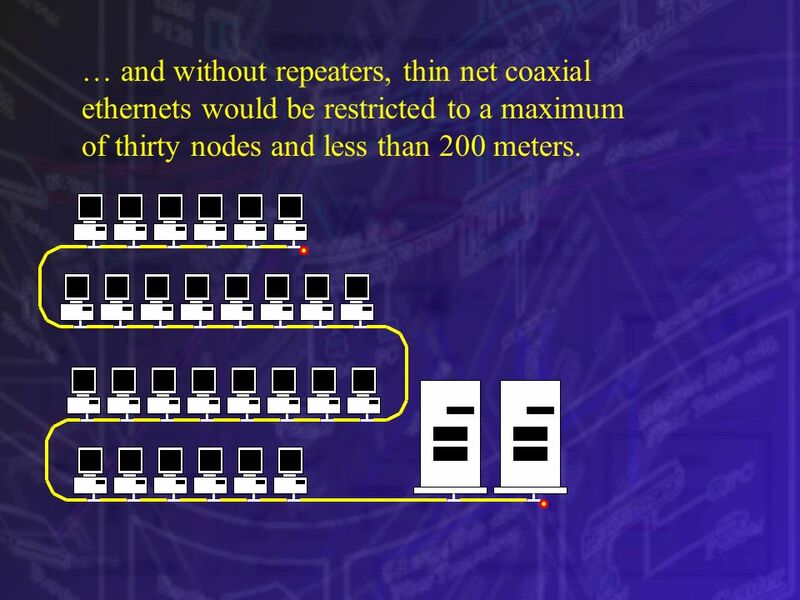 8 … and without repeaters, thin net coaxial ethernets would be restricted to a maximum of thirty nodes and less than 200 meters. 10 This is still a single ethernet segment. ONE subnet All transmissions sent by ANY host on these example configurations would be received by all of the other hosts No routing functions are performed i.e. 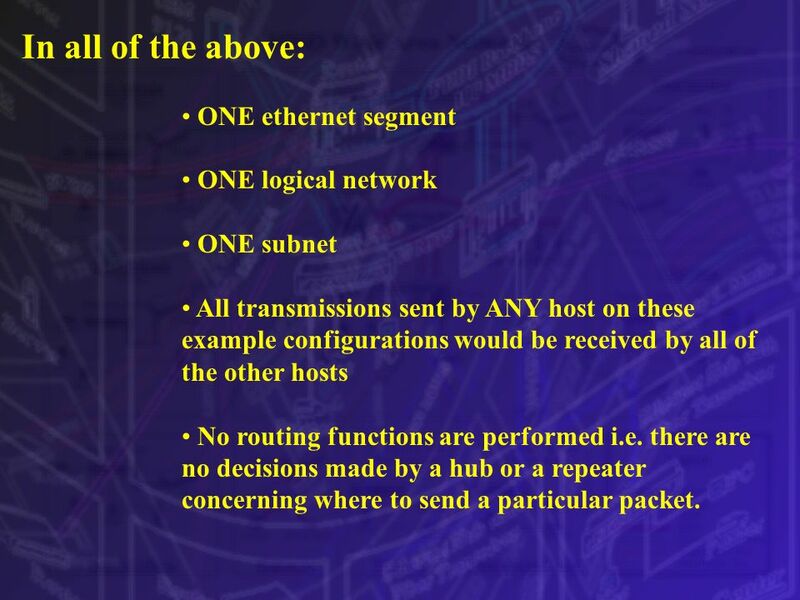 there are no decisions made by a hub or a repeater concerning where to send a particular packet. 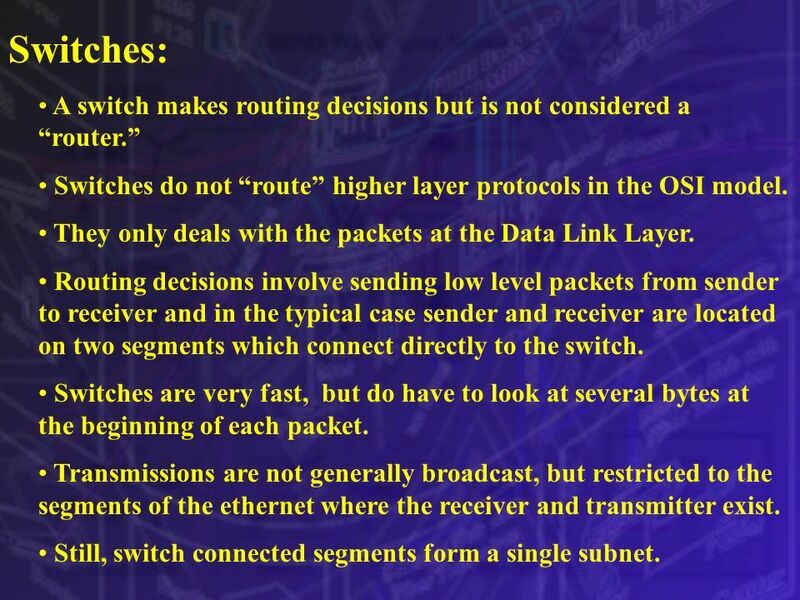 14 Switches: A switch makes routing decisions but is not considered a “router.” Switches do not “route” higher layer protocols in the OSI model. They only deals with the packets at the Data Link Layer. 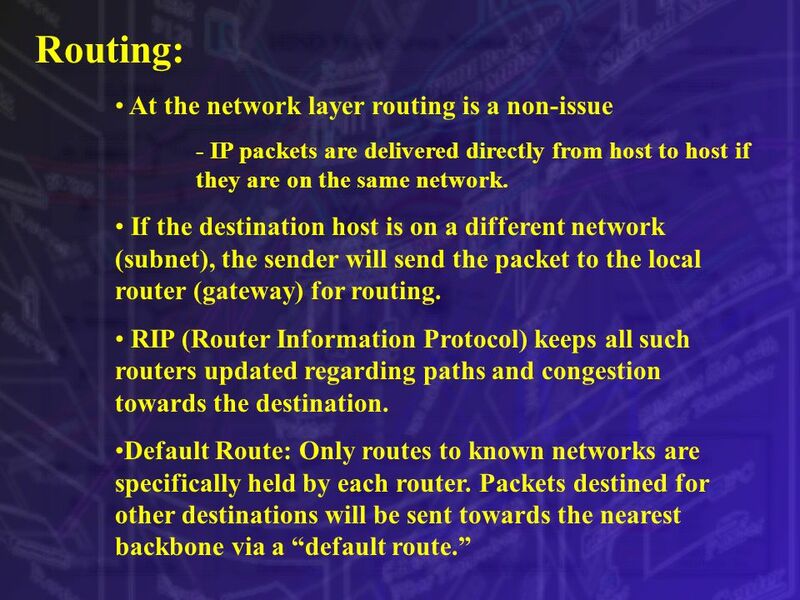 Routing decisions involve sending low level packets from sender to receiver and in the typical case sender and receiver are located on two segments which connect directly to the switch. 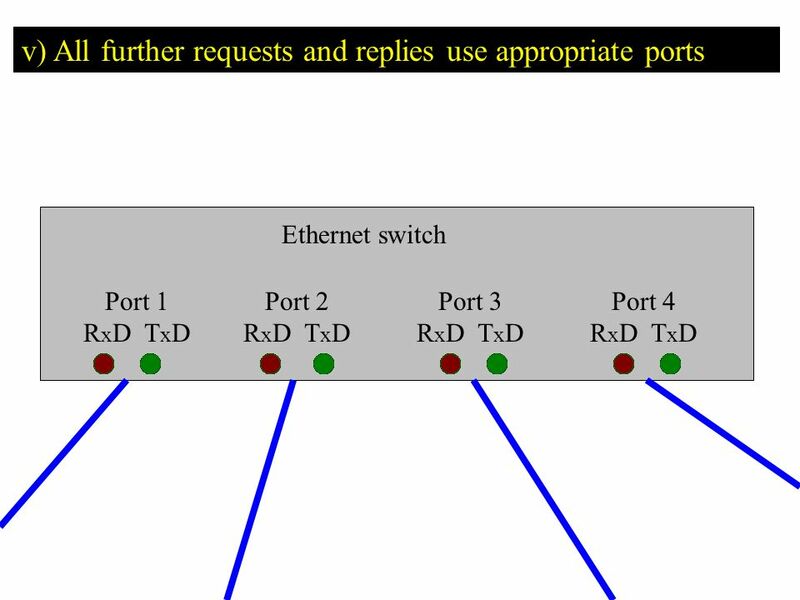 Switches are very fast, but do have to look at several bytes at the beginning of each packet. 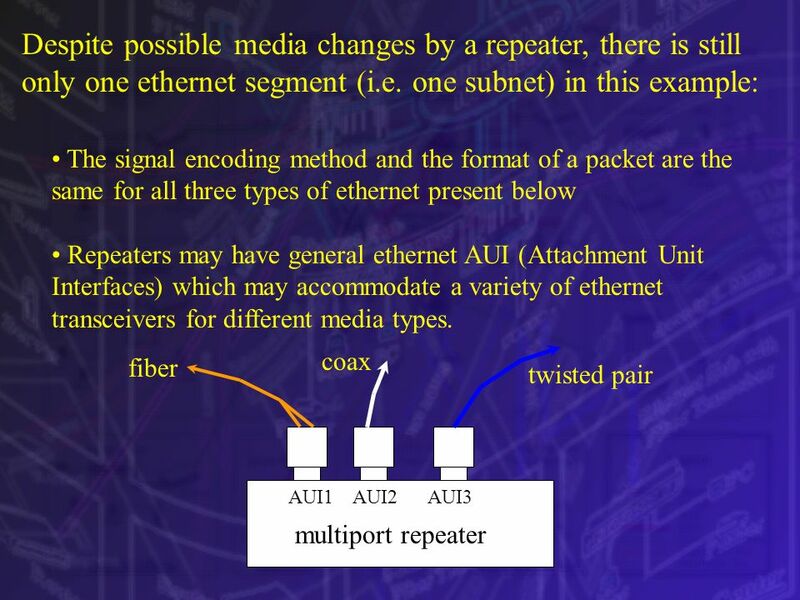 Transmissions are not generally broadcast, but restricted to the segments of the ethernet where the receiver and transmitter exist. 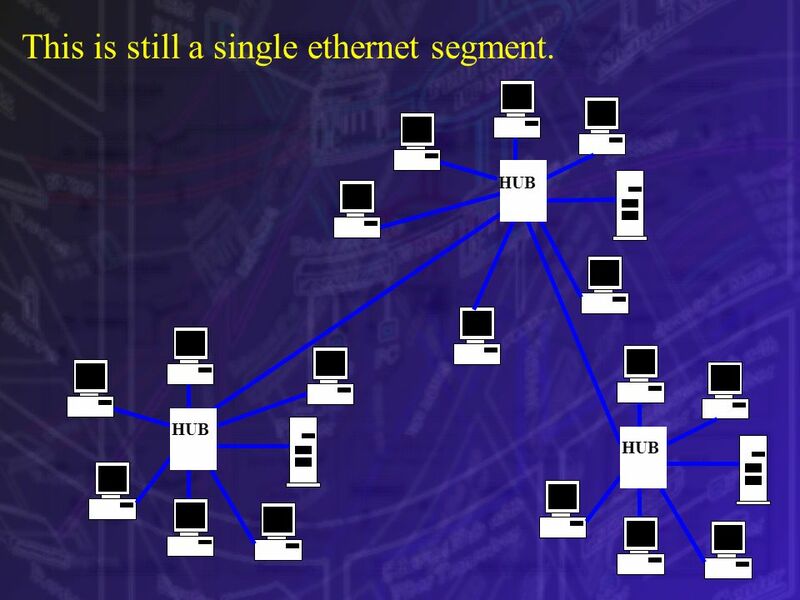 Still, switch connected segments form a single subnet. 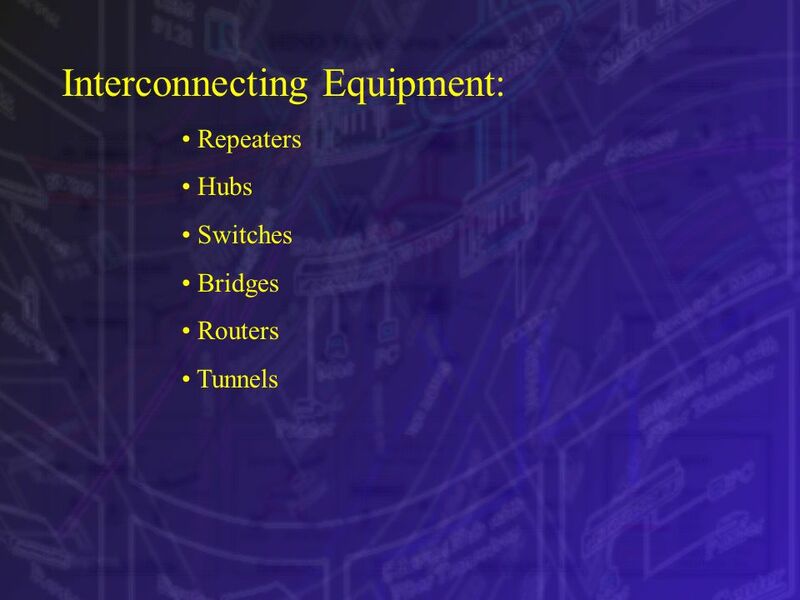 16 Bridges and Routers: These are closely related. Bridges often perform routing functions. 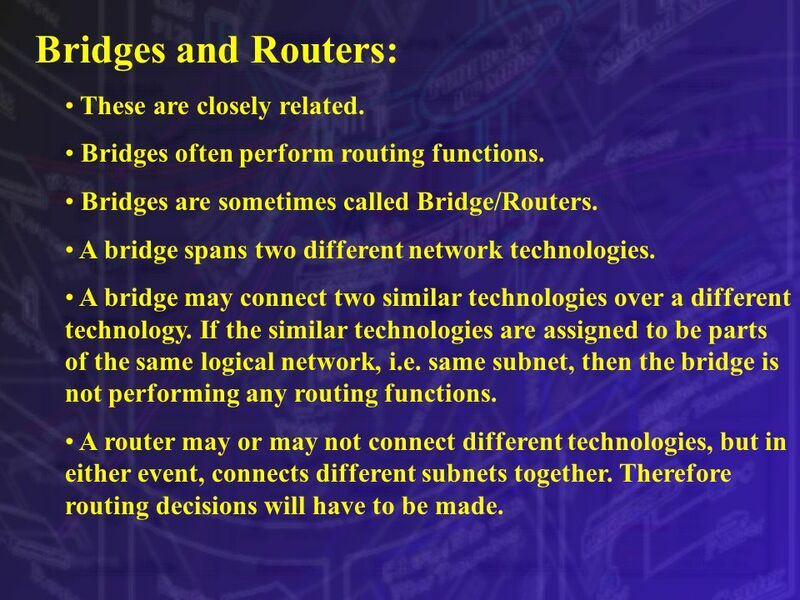 Bridges are sometimes called Bridge/Routers. 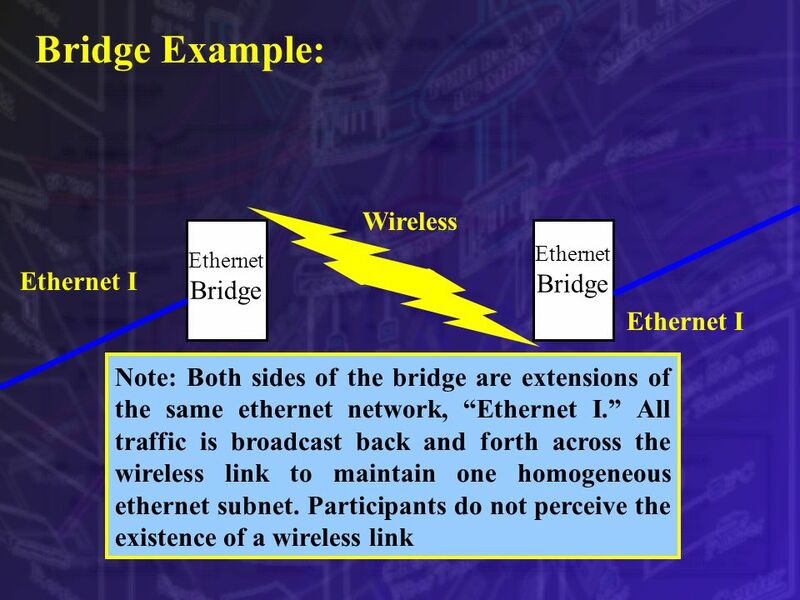 A bridge spans two different network technologies. A bridge may connect two similar technologies over a different technology. 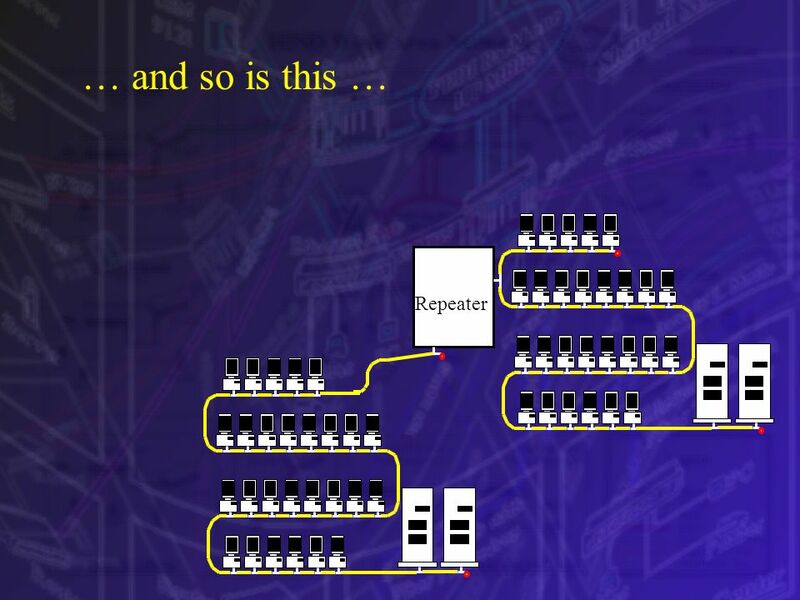 If the similar technologies are assigned to be parts of the same logical network, i.e. same subnet, then the bridge is not performing any routing functions. 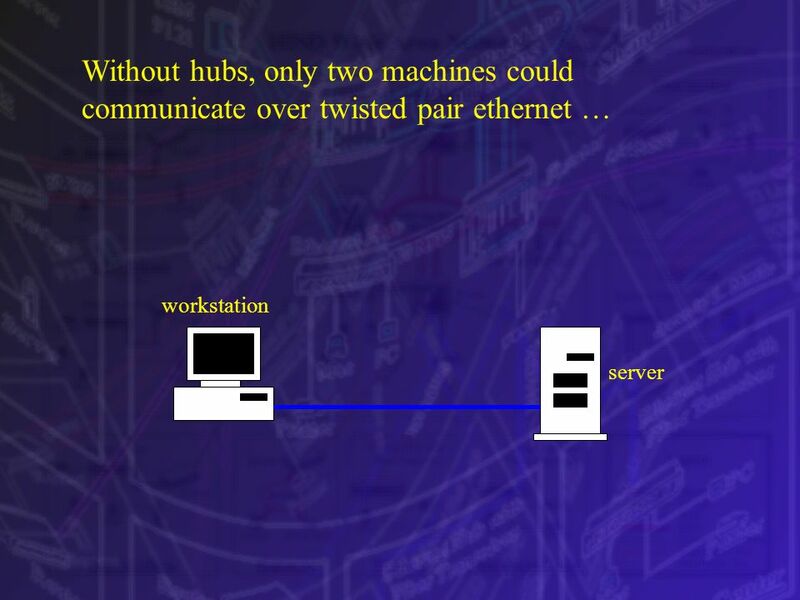 A router may or may not connect different technologies, but in either event, connects different subnets together. Therefore routing decisions will have to be made. 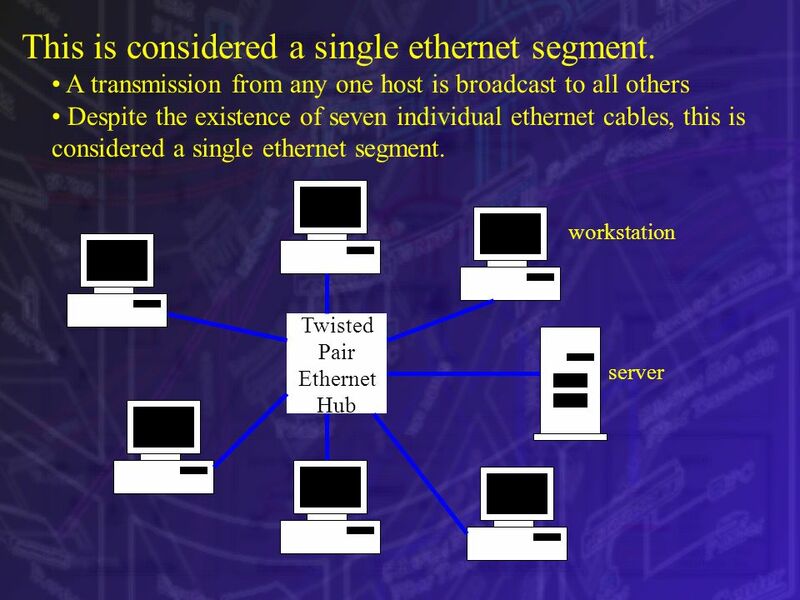 Ethernet Router Ethernet II Ethernet I Note: Each side of the router is a separate ethernet network. 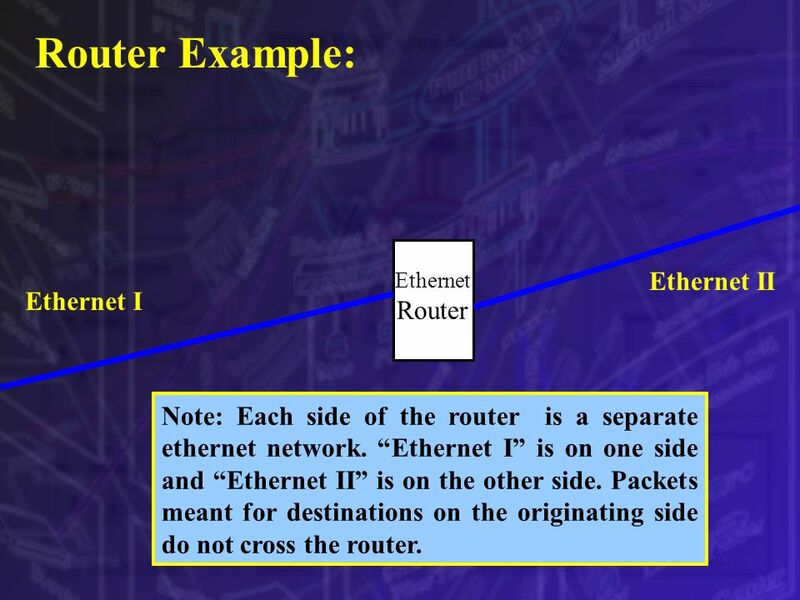 “Ethernet I” is on one side and “Ethernet II” is on the other side. Packets meant for destinations on the originating side do not cross the router. 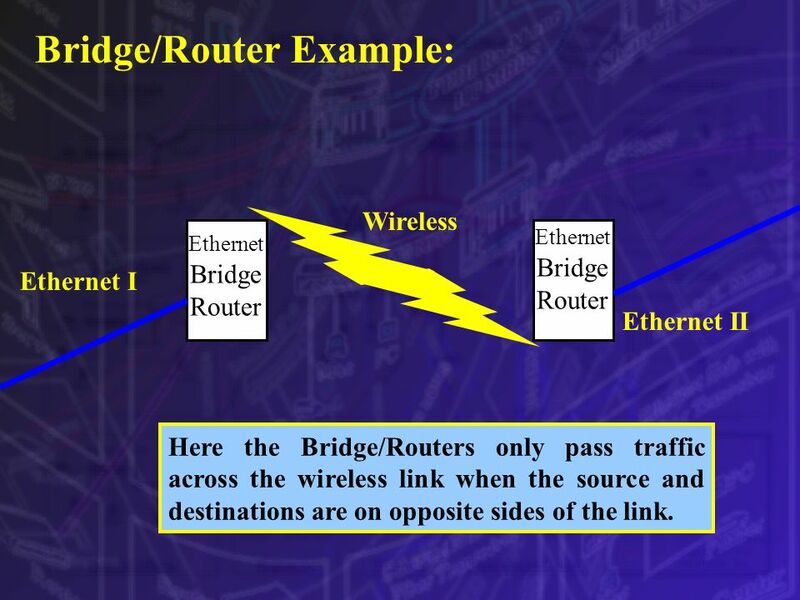 Wireless Ethernet Bridge Router Ethernet BridgeRouter Ethernet I Ethernet II Here the Bridge/Routers only pass traffic across the wireless link when the source and destinations are on opposite sides of the link. 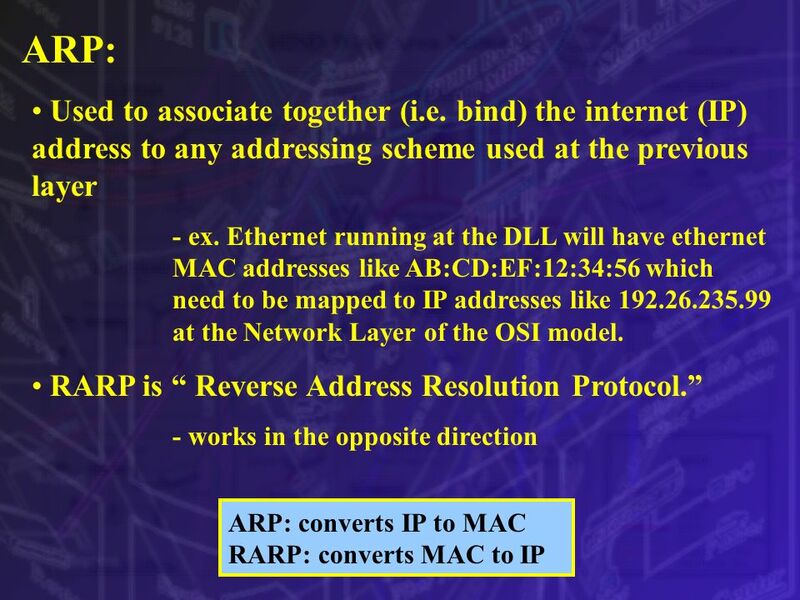 23 Part 3 – Internet Addressing: Although it is conceivable that some other standard could be developed to internetwork different technologies and organizations together, the world has settled on a particular scheme using a network layer protocol called IP. This stands for Internet Protocol. 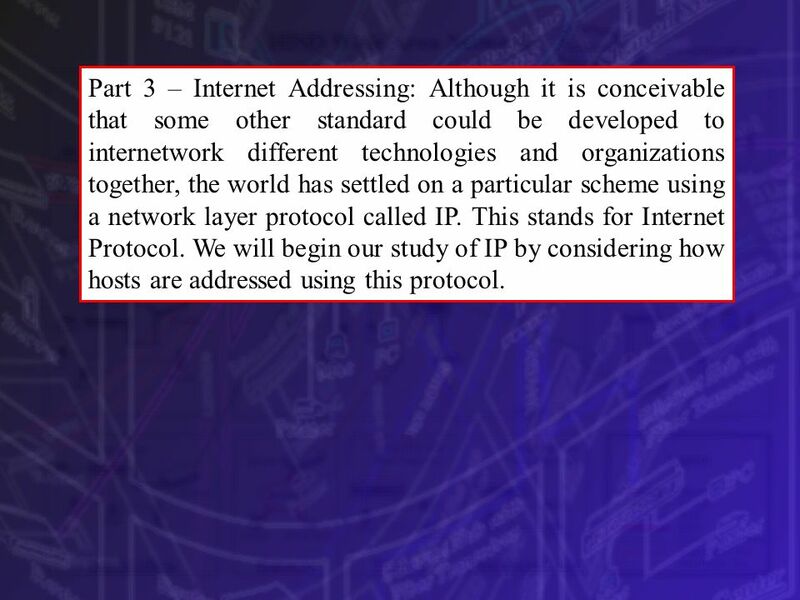 We will begin our study of IP by considering how hosts are addressed using this protocol. “dotted” decimal notation expresses each octet in decimal notation and separates the octets with a period. i.e NNN.NNN.NNN.NNN where NNN is an integer from 0 to 255. 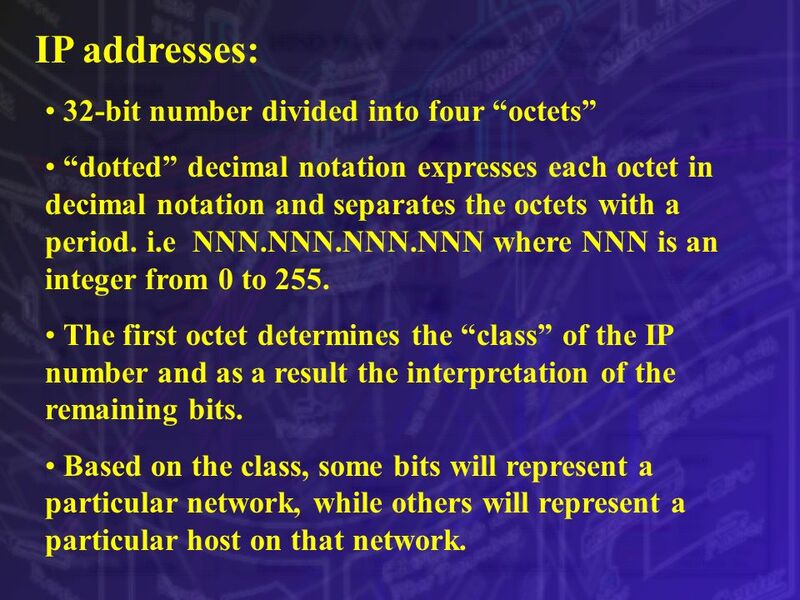 The first octet determines the “class” of the IP number and as a result the interpretation of the remaining bits. 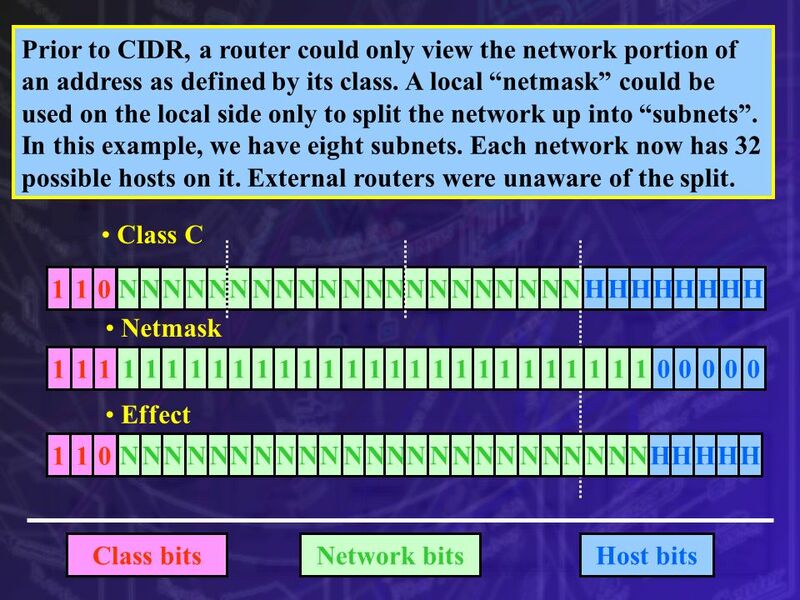 Based on the class, some bits will represent a particular network, while others will represent a particular host on that network. 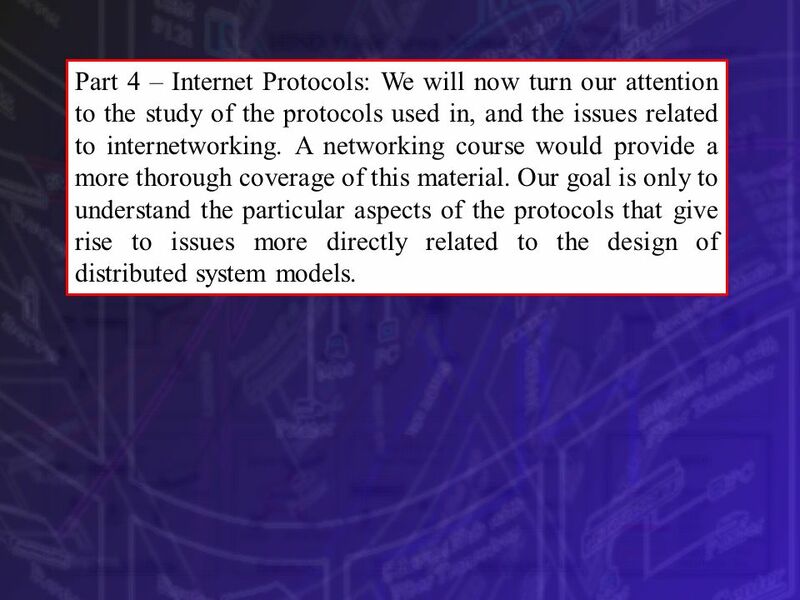 27 Part 4 – Internet Protocols: We will now turn our attention to the study of the protocols used in, and the issues related to internetworking. A networking course would provide a more thorough coverage of this material. Our goal is only to understand the particular aspects of the protocols that give rise to issues more directly related to the design of distributed system models. 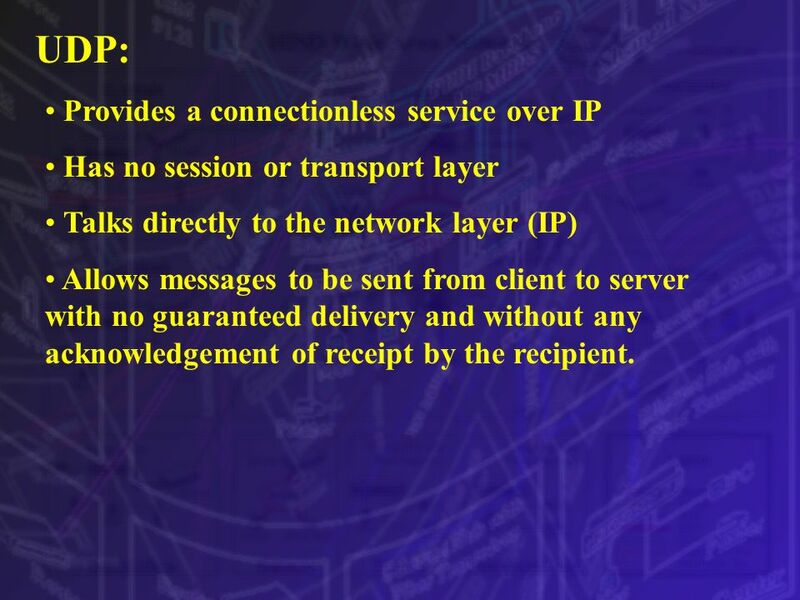 Has no session or transport layer Talks directly to the network layer (IP) Allows messages to be sent from client to server with no guaranteed delivery and without any acknowledgement of receipt by the recipient. 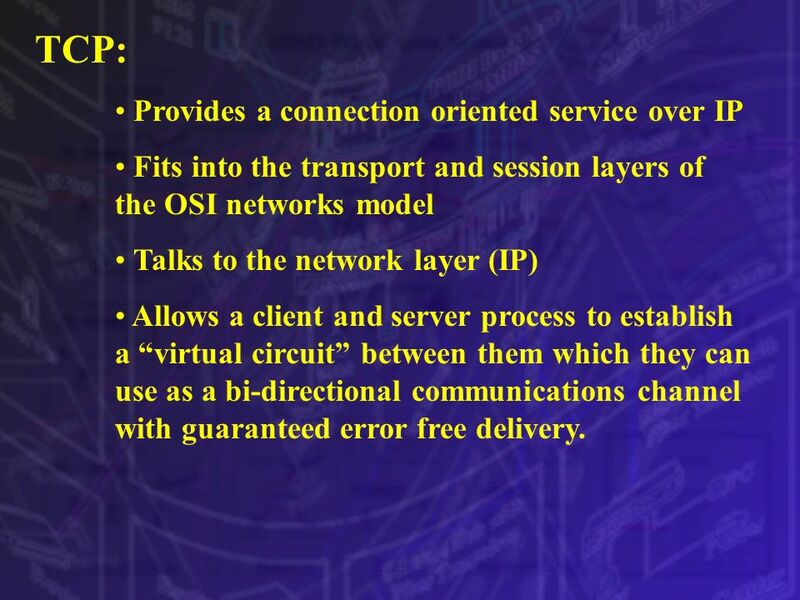 Fits into the transport and session layers of the OSI networks model Talks to the network layer (IP) Allows a client and server process to establish a “virtual circuit” between them which they can use as a bi-directional communications channel with guaranteed error free delivery. 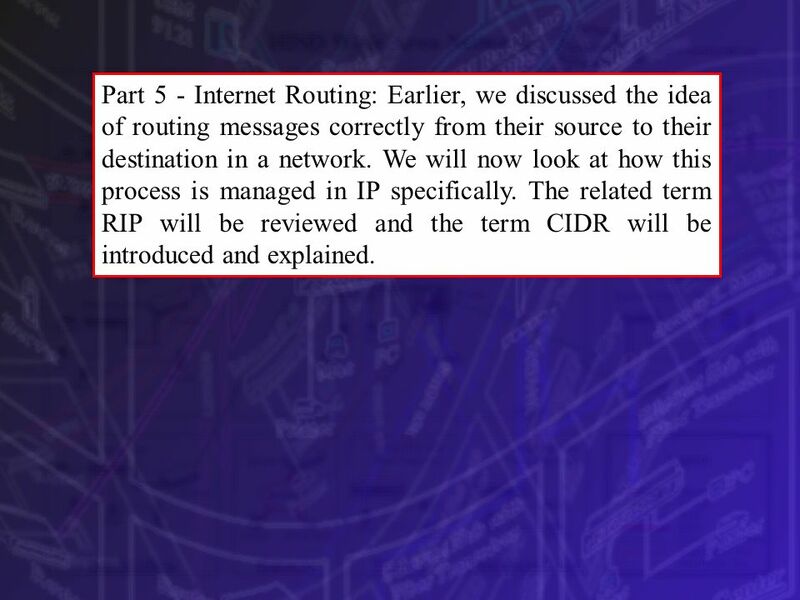 32 Part 5 - Internet Routing: Earlier, we discussed the idea of routing messages correctly from their source to their destination in a network. We will now look at how this process is managed in IP specifically. The related term RIP will be reviewed and the term CIDR will be introduced and explained. 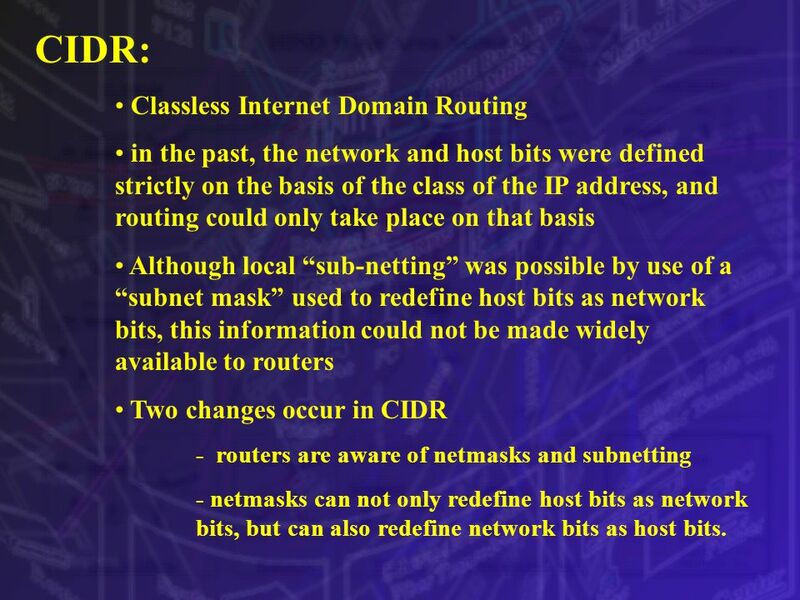 in the past, the network and host bits were defined strictly on the basis of the class of the IP address, and routing could only take place on that basis Although local “sub-netting” was possible by use of a “subnet mask” used to redefine host bits as network bits, this information could not be made widely available to routers Two changes occur in CIDR - routers are aware of netmasks and subnetting - netmasks can not only redefine host bits as network bits, but can also redefine network bits as host bits. 37 Part 6 - IPv6: Currently, version 4 of the IP protocol is predominantly being used in the Internet. 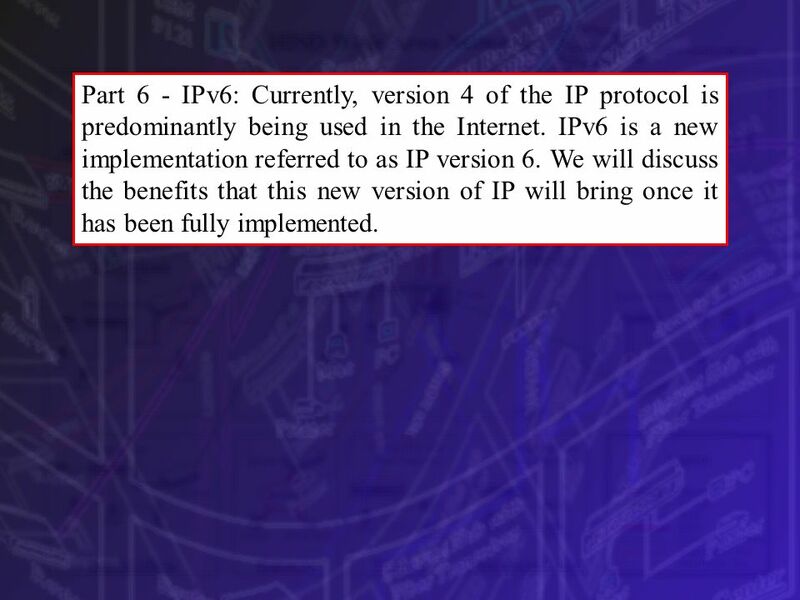 IPv6 is a new implementation referred to as IP version 6. We will discuss the benefits that this new version of IP will bring once it has been fully implemented. IP Protocol - Introduction Dr. Farid Farahmand. 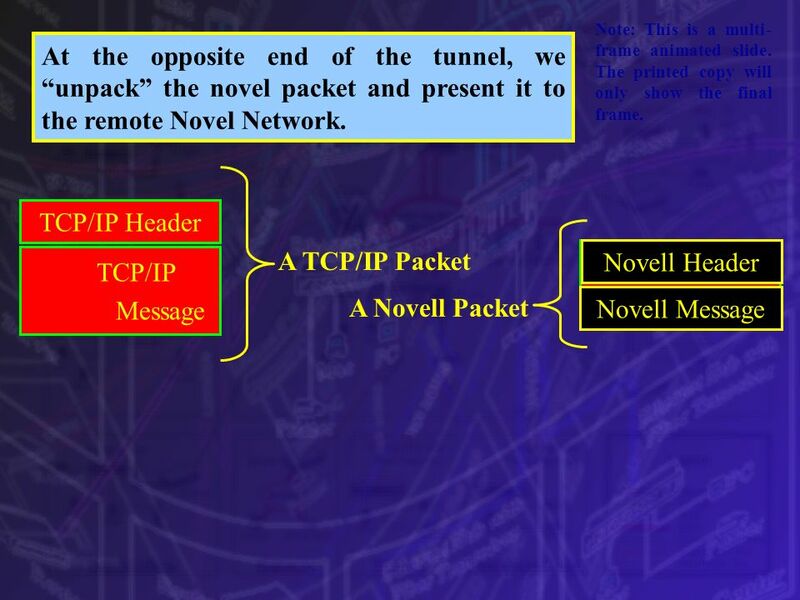 Introduction TDM transport networks are not sufficient for data communications Low utilization TDM networks. © 2007 Cisco Systems, Inc. All rights reserved.Cisco Public 1 Version 4.0 Communicating over the Network Network Fundamentals – Chapter 2. Networking Theory (Part 1). 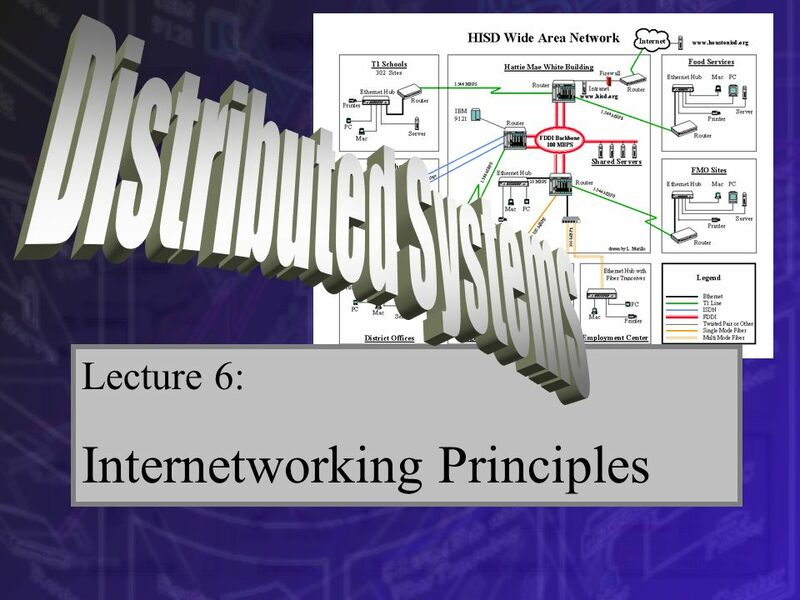 Introduction Overview of the basic concepts of networking Also discusses essential topics of networking theory. Understanding Networks. Objectives Compare client and network operating systems Learn about local area network technologies, including Ethernet, Token. 1 Version 3.0 Module 10 Routing Fundamentals and Subnetting. 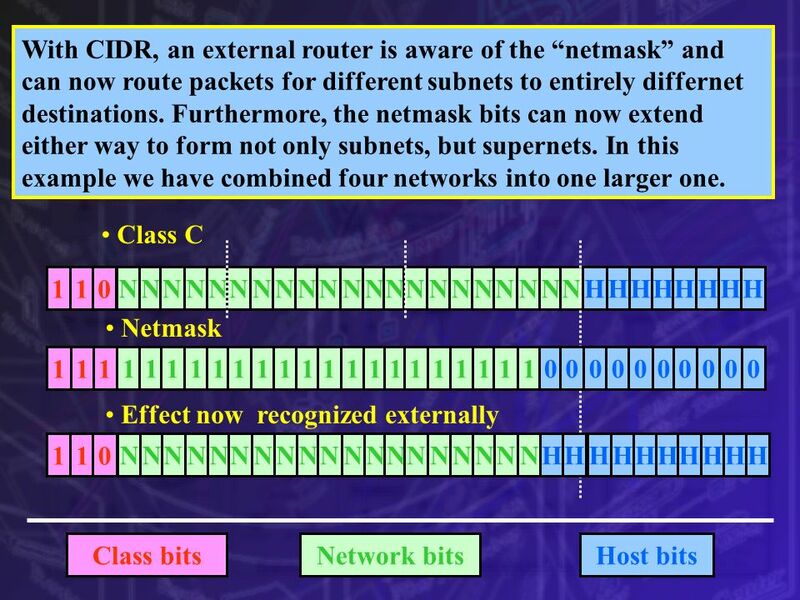 Network Protocols and Standards (Part 1). 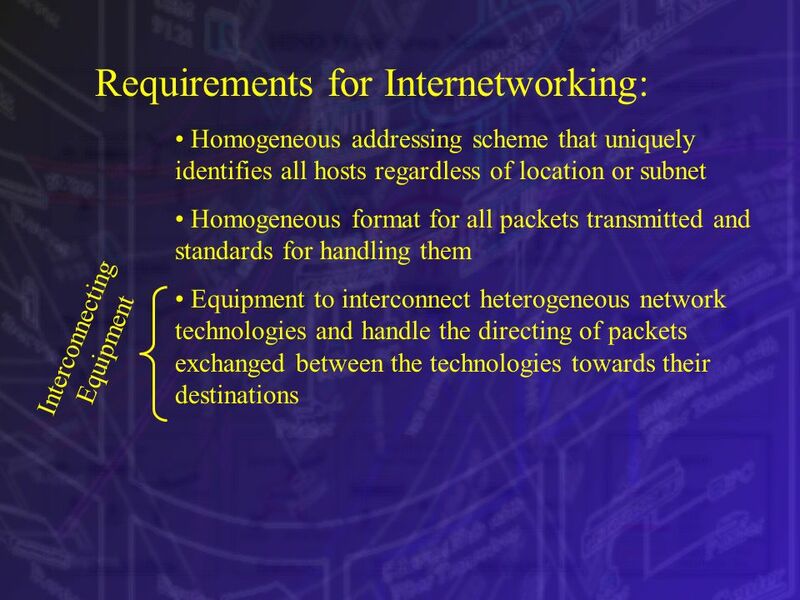 Network Protocols Understanding the concepts of networking protocols is critical to being able to troubleshoot. Network Layer (Part IV). Overview A router is a type of internetworking device that passes data packets between networks based on Layer 3 addresses. A. 1. 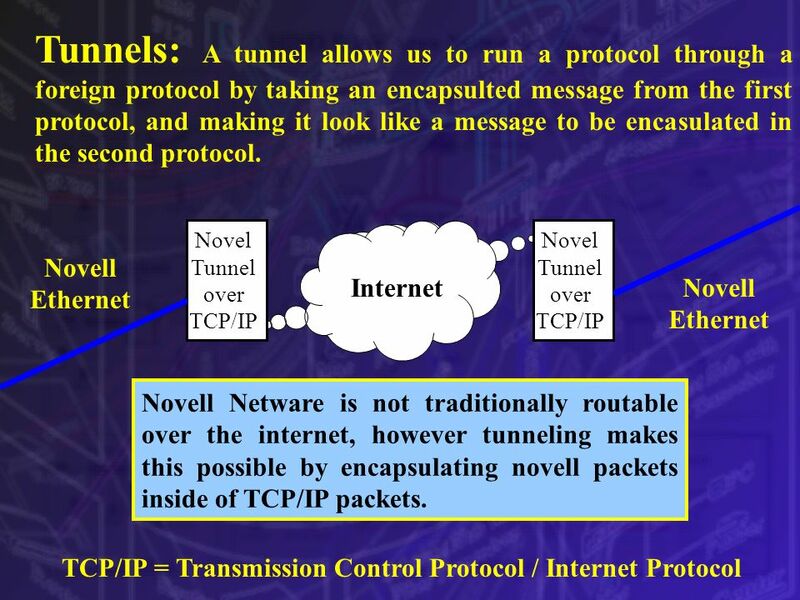  A protocol is a set of rules that governs the communications between computers on a network. 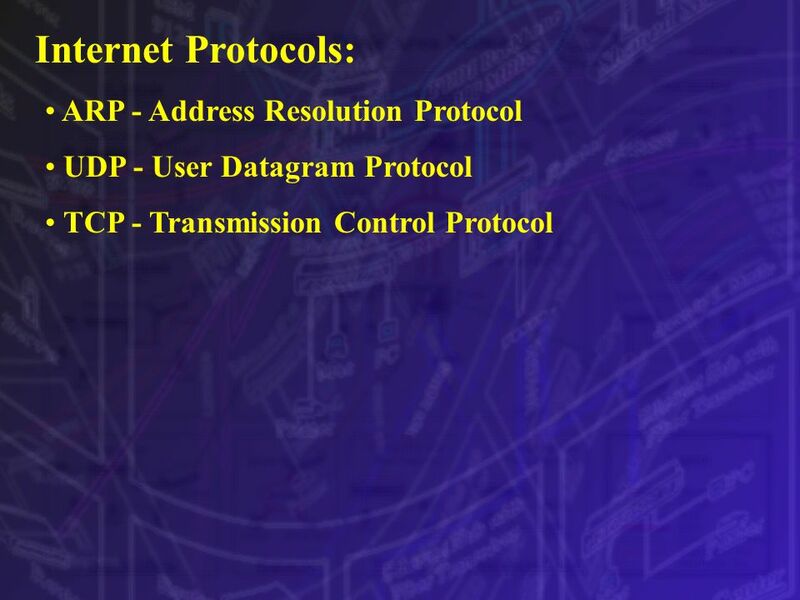  Functions of protocols:  Addressing  Data Packet. 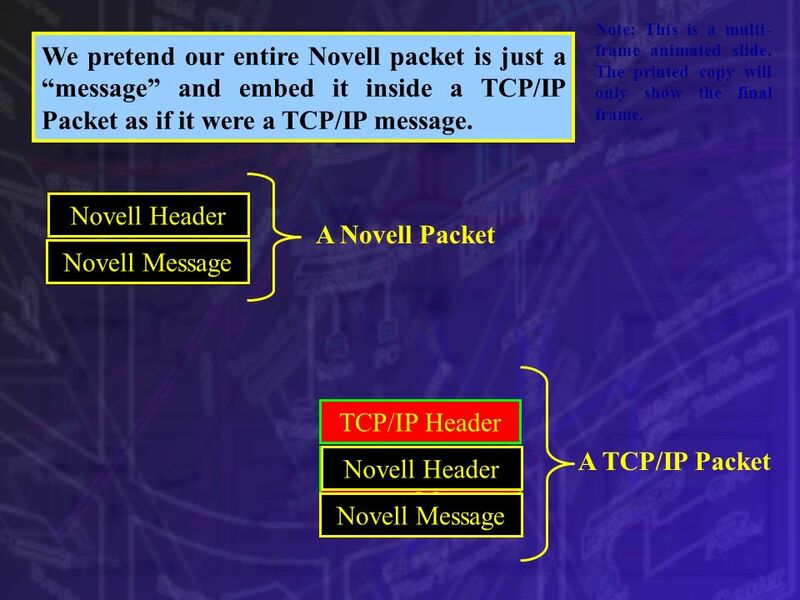 11 NETWORK LAYER PROTOCOLS Chapter 5 IP IPX NetBEUI AppleTalk.